The pump is a new addition to the GSZ-series of submersible high head, high volume pumps, The GSZ-150-4 equipped with a 150 kW motor. Tsurumi’s GSZ-series pumps are designed to required to run continuously under harsh conditions, e.g., mining, quarries, construction and tunnel projects, etc. The new GSZ-150-4 is positioned as the highest class model of the series. The GSZ-150-4 delivers a max. head of 70 m and max. capacity of 19 m3/min. To stand up to harsh conditions of use, the impeller is made of highly wear-resistant, high-chromium cast iron. 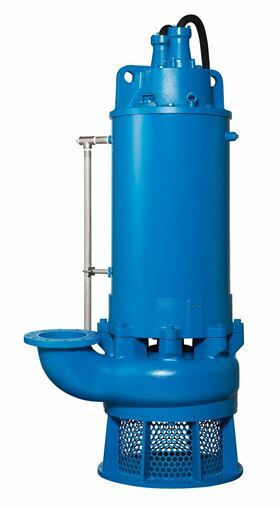 The pump is designed and built for side discharge by way of a spiral flow route that ensures smooth passage of solid matter. Moreover, the motor is encased in a water jacket that cools the motor if kept running at low water level for extended periods of time.